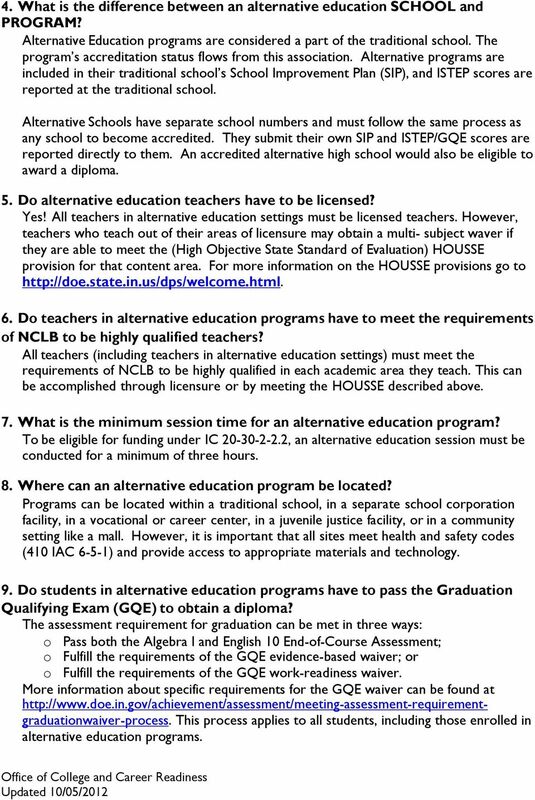 Download "Alternative Education Q &A"
1 Alternative Education Q &A 1. What is alternative education? Alternative Education is designed to meet the needs of highly at-risk students who are not succeeding in the traditional setting. In alternative programs, students are provided with a variety of options that can lead to graduation and are supported by services for themselves and their immediate families that are essential to success. While each program is unique, they share characteristics identified in the research as common to successful alternative schools. o Maximum teacher/student ratio of 1:15 o Small student base o Clearly stated mission and discipline code o Caring faculty with continual staff development o School staff having high expectations for student achievement o Learning program specific to the student s expectations and learning style o Flexible school schedule with community involvement and support o Total commitment to have each student be a success 2. Are there different types of alternative education programs? Alternative education types include but are not limited to: alternative classrooms, schoolwithin-a-school programming, separate alternative schools, and second or last-chance schools for disruptive students. Just as there are many types and settings for alternative schools, there are many delivery models based on the programs philosophy and the needs of the students they serve. Some focus primarily on helping academically at-risk students become successful. Others may combine academics with vocational interventions and/or school-community partnerships to make school meaningful while preparing students for the future. Still others enm0ply a behavioral intervention model to get students back on the right track. In Indiana, the programs and models designed to meet the needs of disaffected youth are as diverse as the students themselves. 3. 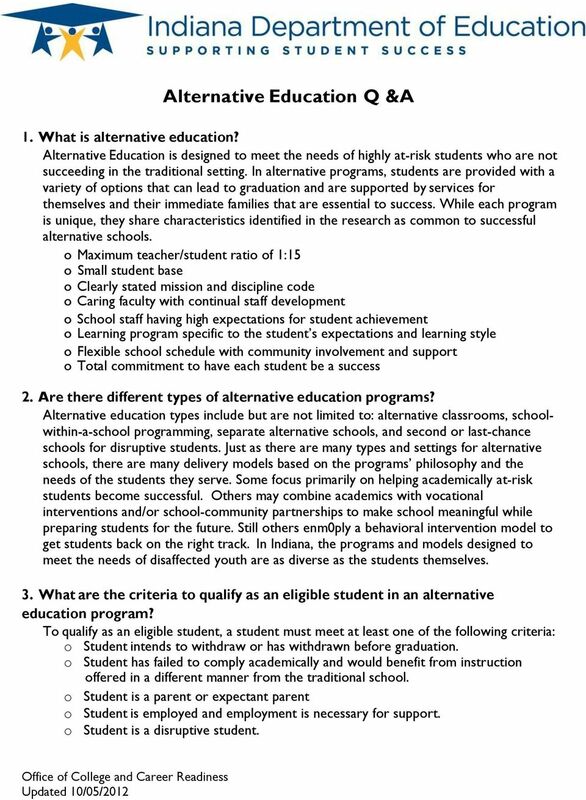 What are the criteria to qualify as an eligible student in an alternative education program? To qualify as an eligible student, a student must meet at least one of the following criteria: o Student intends to withdraw or has withdrawn before graduation. o Student has failed to comply academically and would benefit from instruction offered in a different manner from the traditional school. o Student is a parent or expectant parent o Student is employed and employment is necessary for support. o Student is a disruptive student. 2 4. What is the difference between an alternative education SCHOOL and PROGRAM? Alternative Education programs are considered a part of the traditional school. The program s accreditation status flows from this association. Alternative programs are included in their traditional school s School Improvement Plan (SIP), and ISTEP scores are reported at the traditional school. Alternative Schools have separate school numbers and must follow the same process as any school to become accredited. They submit their own SIP and ISTEP/GQE scores are reported directly to them. An accredited alternative high school would also be eligible to award a diploma. 5. Do alternative education teachers have to be licensed? Yes! All teachers in alternative education settings must be licensed teachers. However, teachers who teach out of their areas of licensure may obtain a multi- subject waver if they are able to meet the (High Objective State Standard of Evaluation) HOUSSE provision for that content area. For more information on the HOUSSE provisions go to 6. Do teachers in alternative education programs have to meet the requirements of NCLB to be highly qualified teachers? All teachers (including teachers in alternative education settings) must meet the requirements of NCLB to be highly qualified in each academic area they teach. This can be accomplished through licensure or by meeting the HOUSSE described above. 7. What is the minimum session time for an alternative education program? To be eligible for funding under IC , an alternative education session must be conducted for a minimum of three hours. 8. Where can an alternative education program be located? Programs can be located within a traditional school, in a separate school corporation facility, in a vocational or career center, in a juvenile justice facility, or in a community setting like a mall. However, it is important that all sites meet health and safety codes (410 IAC 6-5-1) and provide access to appropriate materials and technology. 9. Do students in alternative education programs have to pass the Graduation Qualifying Exam (GQE) to obtain a diploma? The assessment requirement for graduation can be met in three ways: o Pass both the Algebra I and English 10 End-of-Course Assessment; o Fulfill the requirements of the GQE evidence-based waiver; or o Fulfill the requirements of the GQE work-readiness waiver. More information about specific requirements for the GQE waiver can be found at This process applies to all students, including those enrolled in alternative education programs. 3 10. Can certain diploma requirements be waived for students in alternative education programs? Students in alternative education programs/schools must meet the same state diploma requirements as students in traditional high schools. However, if the school corporation has added additional local requirements for graduation, they are free to waive those additional requirements for students in the alternative program. 11. Do alternative programs/schools have their own graduation ceremonies or do their students participate in the traditional high school ceremony? Since most programs grant diplomas through their traditional high school, students in the alternative education program participate in the traditional high school ceremony. Alternative schools that award their own diploma and some alternative programs offer their own ceremonies. 12. Are school corporations required to offer an alternative education program? No. School corporations may establish an alternative education program on its own or participate in a joint area alternative program. 13. Can a special education student be enrolled in an alternative school where there are no certified special education teachers? The case conference committee in developing the Individual Education Plan (IEP) would have to recommend the alternative program/school placement as the Least Restrictive Environment (LRE) for that actual placement to be made. 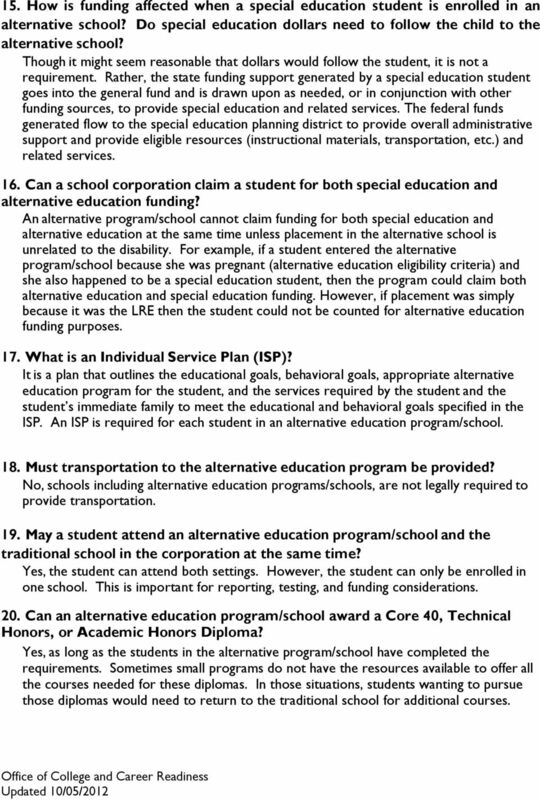 The key issue is whether the services indicated in the IEP could be delivered at the alternative school. Also, the Teacher of Record (TOR) requirement would have to be met (e.g. a properly certified teacher in the student's exceptionality area) though the TOR would not necessarily have to be physically located at the alternative school. If these conditions are not met, the school might be out of compliance which could jeopardize funding or open them to litigation. 14. Is it legal to deny a special education student access to the alternative education program/school? No. Access to the alternative program/school should be an option available to students with disabilities. That is, students with disabilities should not be excluded on the basis of disability. The case conference committee should make the recommendation based on what constitutes a Free Appropriate Public Education (FAPE) in the LRE for the student. If the alternative program/school is that place, then the student should be served. However, alternative education programs are not intended as special education programs so the case conference committee would need to determine if the appropriate staff and services are available and whether the student meets the eligibility criteria listed above. 4 15. How is funding affected when a special education student is enrolled in an alternative school? Do special education dollars need to follow the child to the alternative school? Though it might seem reasonable that dollars would follow the student, it is not a requirement. Rather, the state funding support generated by a special education student goes into the general fund and is drawn upon as needed, or in conjunction with other funding sources, to provide special education and related services. The federal funds generated flow to the special education planning district to provide overall administrative support and provide eligible resources (instructional materials, transportation, etc.) and related services. 16. Can a school corporation claim a student for both special education and alternative education funding? An alternative program/school cannot claim funding for both special education and alternative education at the same time unless placement in the alternative school is unrelated to the disability. For example, if a student entered the alternative program/school because she was pregnant (alternative education eligibility criteria) and she also happened to be a special education student, then the program could claim both alternative education and special education funding. However, if placement was simply because it was the LRE then the student could not be counted for alternative education funding purposes. 17. What is an Individual Service Plan (ISP)? It is a plan that outlines the educational goals, behavioral goals, appropriate alternative education program for the student, and the services required by the student and the student s immediate family to meet the educational and behavioral goals specified in the ISP. An ISP is required for each student in an alternative education program/school. 18. Must transportation to the alternative education program be provided? No, schools including alternative education programs/schools, are not legally required to provide transportation. 19. May a student attend an alternative education program/school and the traditional school in the corporation at the same time? Yes, the student can attend both settings. However, the student can only be enrolled in one school. This is important for reporting, testing, and funding considerations. 20. Can an alternative education program/school award a Core 40, Technical Honors, or Academic Honors Diploma? Yes, as long as the students in the alternative program/school have completed the requirements. Sometimes small programs do not have the resources available to offer all the courses needed for these diplomas. In those situations, students wanting to pursue those diplomas would need to return to the traditional school for additional courses. 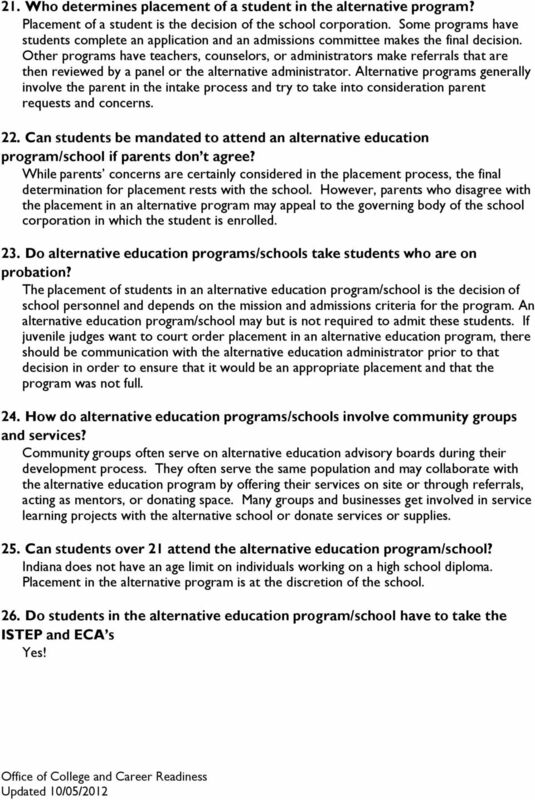 5 21. Who determines placement of a student in the alternative program? Placement of a student is the decision of the school corporation. Some programs have students complete an application and an admissions committee makes the final decision. Other programs have teachers, counselors, or administrators make referrals that are then reviewed by a panel or the alternative administrator. Alternative programs generally involve the parent in the intake process and try to take into consideration parent requests and concerns. 22. Can students be mandated to attend an alternative education program/school if parents don t agree? While parents concerns are certainly considered in the placement process, the final determination for placement rests with the school. However, parents who disagree with the placement in an alternative program may appeal to the governing body of the school corporation in which the student is enrolled. 23. Do alternative education programs/schools take students who are on probation? The placement of students in an alternative education program/school is the decision of school personnel and depends on the mission and admissions criteria for the program. An alternative education program/school may but is not required to admit these students. If juvenile judges want to court order placement in an alternative education program, there should be communication with the alternative education administrator prior to that decision in order to ensure that it would be an appropriate placement and that the program was not full. 24. How do alternative education programs/schools involve community groups and services? Community groups often serve on alternative education advisory boards during their development process. They often serve the same population and may collaborate with the alternative education program by offering their services on site or through referrals, acting as mentors, or donating space. Many groups and businesses get involved in service learning projects with the alternative school or donate services or supplies. 25. Can students over 21 attend the alternative education program/school? Indiana does not have an age limit on individuals working on a high school diploma. Placement in the alternative program is at the discretion of the school. 26. Do students in the alternative education program/school have to take the ISTEP and ECA s Yes! On Page 5: Q: What documents should be part of the student s scholastic record? Q: What must be included in the preliminary re-enrollment plan?